while... now, "this season" as they say, let Madness commence! Vorpal blade at the ready, here's the Alice Madness Ensemble! <br> <br> Not so much a minidress, as a separate top, skirt and pinny - but assemble the pieces and it looks like a minidress :D <br> <br> The bodice is made from Midnight Steamed Velvet, with authentically Alice-esque puffed sleeves. There's a nice clean white cotton centre panel; perfect for showing up how much blood you've spilled... ;)<br> <br> The skirt has an underskirt of white taffeta , two layers of stiff white net, and a shorter upper one of steamed velvet. <br> <br> The pinny (again in white taffeta) ties in a bow at the back :) <br> <br> There is of course one other detail that's not usually found on Moonmaiden garments... blood! And sigils! We can do them as per the photos, we can understate it... or go way over the top if you want it as gory as possible, just let us know! :D <br> <br> We can make the outfit in other colours should you wish to be your OWN Alice, just ask us :D Or keep it trad using the checkout below! while... now, "this season" as they say, let Madness commence! 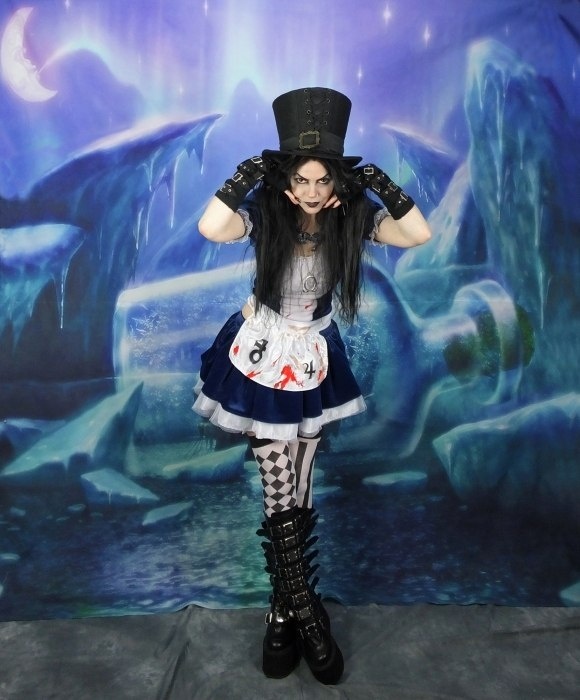 Vorpal blade at the ready, here's the Alice Madness Ensemble! The skirt has an underskirt of white taffeta , two layers of stiff white net, and a shorter upper one of steamed velvet. We can make the outfit in other colours should you wish to be your OWN Alice, just ask us :D Or keep it trad using the checkout below!